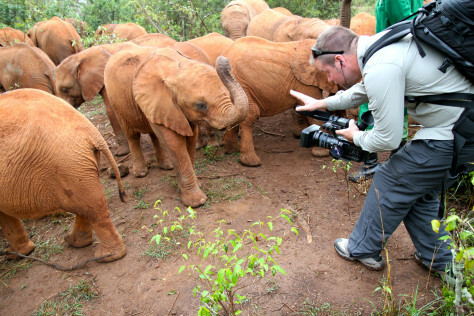 On Thursday, NBC's Nightly News features a baby elephant orphanage in Kenya, where wild animals that have been victims of ivory poaching are cared for-- thanks in part to a special foster program that's part of the David Sheldrick Wildlife Trust. Producer Marisa Buchanan and correspondent Maria Menounos spent some time with the baby elephants—check out their photo gallery here. 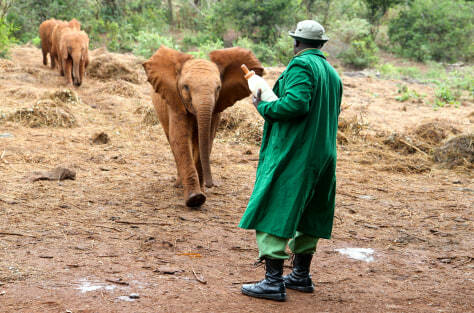 The Sheldrick Trust raises and feeds infant elephants until they are around three years of age, when they are released in groups into Kenya's Tsavo National Park and sheltered by elephant families. There is a ritual each morning piling on top of each other as they lazily say good morning. They stretch and bump into each other before being ushered out to the bush with their keepers. 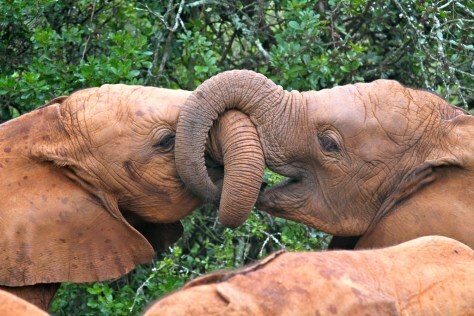 The baby elephants are fed every three hours. The milk was developed by Dame Daphne Sheldrick after extensive research. Elephant milk cannot include cow's milk. 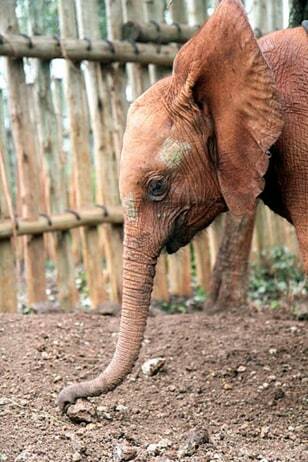 The keepers wean the babies off of the milk over three years, slowly incorporating leaves into their diet. They have to be self sufficient before the release them back into the wild to rejoin other elephant families. 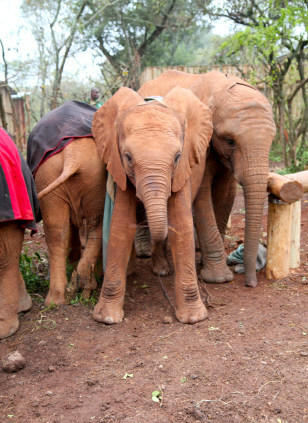 Playtime starts early and lasts all day at the Nairobi Nursury of the Sheldrick Trust. The infants have to get used to the keepers and each other so when they are released back in the wild they can rely on one another. 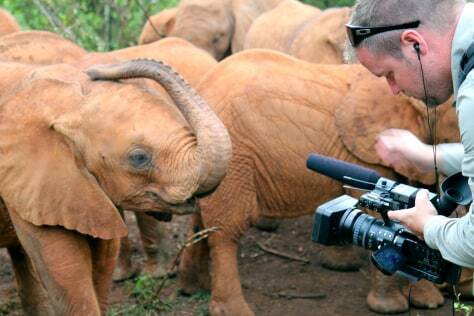 NBC Cameraman Andrew Scritchfield attracted quite a bit of attention at the David Sheldrick Wildlife Trust. So many of these elephants have to get used to humans helping them as many have bad memories of their mother's death by human conflict and poaching. 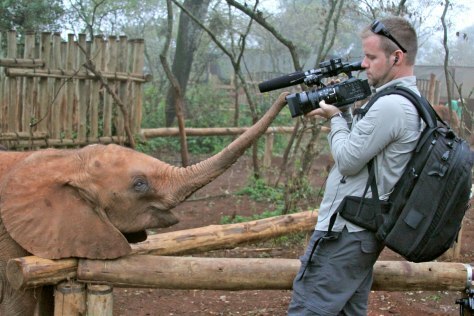 NBC Cameraman Andrew Scritchfield moves in for a close-up shot of his willing subject. NBC Nightly News producer Marisa Buchanan became a moving target when she attempted to kneel down next to the three week old Wasin for a picture. He won. 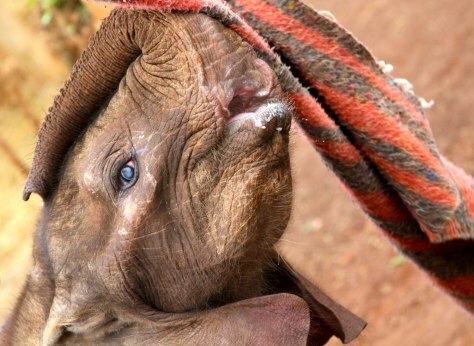 Blankets are very important to raising the elephants according to the team at DSWT. They mimic the feel of the mother and make it easier for them to feel comfortable while feeding. Another important discovery by founder Dame Daphne Sheldrick. 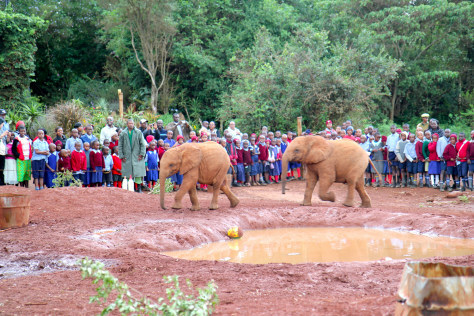 The trust opens its doors to tourists and Kenyan school children every day for one hour, during which the elephants get their daily mudbath and some times even kick around the soccer ball. NBC's Maria Menounos learned that infants like this one to be scratched behind the ears and wrap their trunks around you. they're still little ones, they need all the familiar things: 3 AM feedings, warm blankets, learning right from wrong. But when it's time to let these little ones go, things get a lot less familiar. One woman has been through the routine more than 100 times and, as you're about to see, she's making an important difference. To tell her story, NBC 's Maria Menounos traveled to Nairobi , Kenya . MARIA MENOUNOS reporting: It's 6 AM , and three-week-old Wasin is just waking up. Nearby, 18 other sleepy orphans are in need of a stretch, a push, and even a morning cuddle. Their keepers guide them every step of the way. 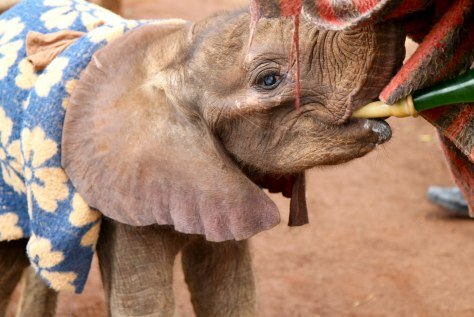 For over 30 years, the David Sheldrick Wildlife Trust has been rescuing baby elephants like these, and they're teaching them what their moms would have taught them had they not been victims of poaching, like Olare . Before he was rescued, young Olare wept by his dying mother's side for hours. Those kinds of traumatic memories are one of the many reasons keepers stay with the elephants 24 hours a day , even sleep with them at night, and feed them every three hours. Mr. EDWIN LUSICHI (Head Keeper): They all have different characters. Some are very cheeky, very playful, very naughty, very calm, very shy. MENOUNOS: And it was Dame Daphne Sheldrick who figured out their needs. She spent the last 50 years living with and learning from orphaned African elephants as the species is increasingly threatened by human conflict and ivory poaching. Mr. LUSICHI: All that we know has come from her. She's developed the milk, how to give them the care that they need. MENOUNOS: Daphne is the widow of Kenya 's famed conservationist David Sheldrick . They raised all kinds of orphans, along with their own children. But this has become her life's work. There wasn't this big research team, it was you. Dame DAPHNE SHELDRICK: No, none of the zoos could help us. You know, they never, ever had been able to raise an infant elephant themselves. 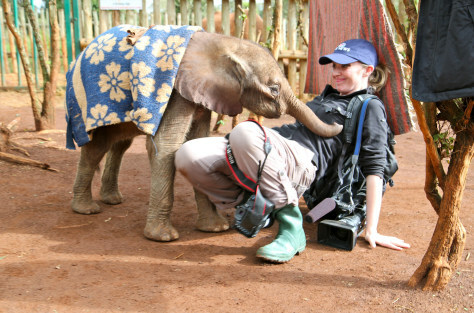 MENOUNOS: Now a world renowned expert, she has successfully raised 130 elephants into adulthood. But it's not been without heartbreak. She says one of the first orphans she raised from infancy died from grief when Daphne took a brief trip. Dame DAPHNE: It was -- you learn the hard way. MENOUNOS: Ever since, the keepers rotate each night so no baby grows too attached. It's always been a family affair, with the help of daughters Jill and Angela . Ms. ANGELA SHELDRICK (Daughter): I think for Daphne , you know, when you see the elephants grown, a huge herd there, and she can stand back and say "but for I," it's a good feeling. Dame DAPHNE: You have to love them, because an elephant can read your heart. 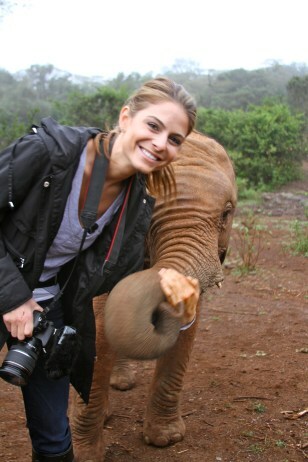 MENOUNOS: Turns out the biggest lesson learned is that elephants are as human as the rest of us . Maria Menounos , NBC News, Nairobi, Kenya .